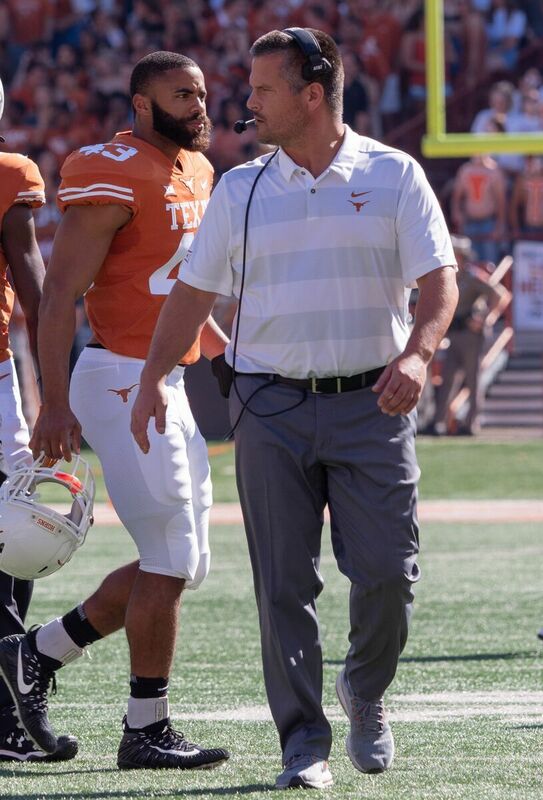 AUSTIN — Head coaches and coordinators that run various iterations of the air raid offense make up a significant chunk of offensive coaching staffs in the Big 12. Texas has faced four of the five main air raid offenses in 2018, with Saturday’s game against Texas Tech the final challenge for Texas against the pass-happy offense Mike Leach brought to the Big 12. Leach’s former quarterback at Texas Tech, Kliff Kingsbury, holds the same role in head coach that Leach did when Kingsbury put the pads on in Lubbock. He runs a similar successful offensive system to his mentor. Those coaches running iterations of that system include Kingsbury, Oklahoma’s Lincoln Riley, West Virginia’s Dana Holgorsen, Oklahoma State’s Mike Gundy, and TCU offensive coordinator Sonny Cumbie. The 2017 defense, led by juniors Malik Jefferson, DeShon Elliott, Holton Hill, and senior Poona Ford performed well against these teams despite Texas’ 1-4 record in those games. They held Oklahoma, Oklahoma State, TCU, and Texas Tech below their average total yardage per game on offense, and knocked WVU’s Will Grier out of the game in which they secured bowl eligibility. At several points throughout the 2018 season, Herman has emphasized how the losses of those players to the NFL Draft and graduation has affected the ability of the defense to perform to 2017 levels. Matchups against air-raid offenses has made those afflictions strikingly evident. In 2017, Texas held those five air-raid teams to 3.09 yards per carry and 7.93 yards per pass attempt. Against those same teams except for Texas Tech, Texas has allowed 5.28 yards per carry and 8.45 yards per pass attempt. While UT is missing four NFL players and an experienced senior, it returned a large core of its 2017 defense with players like Breckyn Hager, Chris Nelson, and Charles Omenihu on the line, two senior linebackers in Gary Johnson and Anthony Wheeler, and experienced secondary players in Davante Davis, Kris Boyd, P.J. Locke, and Brandon Jones. Additionally, two blue-chip prospects in Caden Sterns and B.J. Foster immediately found playing time due to their talent. While a large core returned from 2017, the results have not. After holding air-raid teams below their season averages in 2017, Orlando’s 2018 defense has given up near to above average performances to those same teams. TCU and Oklahoma both had numbers close to their averages, while Oklahoma State posted better passing numbers than their season average. The most recent result against West Virginia was a gashing in the run game. The Mountaineers averaged 7.0 yards per carry, 2.2 more than their season average. Overall, Texas simply is not as good on defense this season as they were last season. Not only do the numbers on the surface back that up, but advanced metrics do too. Texas ranked No. 21 in defensive S&P+ in 2017, second in the Big 12 behind No. 16 TCU. Its defensive FEI was No. 7, first in the Big 12. This year, Texas is No. 50 in defensive S&P+, third in the Big 12 behind No. 24 TCU and No. 27 Iowa State. The Longhorns defensive FEI is fourth in the Big 12 at No. 47. Herman has said previously he choose Orlando as his defensive coordinator both at Houston and at Texas in part because his three-down linemen, quarters coverage defense was the style that gave him the most problems as an offensive coach. The 3-2-6 is predicated on being able to stop the run with light numbers so that teams are forced to pass against six defenders. So far against the air-raid teams where the 3-2-6 has been the preferred option, Texas has allowed 776 rushing yards through four games, 161 more than they allowed in five games last year. The pass defense has dipped as well. Texas has allowed 1,208 yards through the air this season after allowing 1,364 last season. Even a below average game from Texas Tech, regardless of the Red Raiders’ starting quarterback, likely eclipses last year’s mark. The players the Longhorns lost from last year’s defense took with them the ability to defend the run with limited numbers. That resulted in an overall negative effect on the rest of the Texas defense. Searching for a solution, Herman suggested simplification and trimming down the call sheet. He also suggested something more practical and installable. That lack of discipline is what hurt Texas against WVU and could hurt the Horns against Texas Tech, who only has five fewer rushing attempts as the Longhorns, and 25 rushing touchdowns to Texas’ 16. 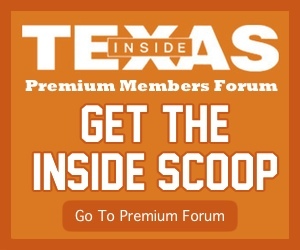 More simply, and encapsulating Texas’ entire issues against air-raid teams this season, “You better be able to stop the run or you’re going to bleed a slow death,” said Herman.